How Does the Legendary Magnum XL-200 Coaster Compare Today? This is the coaster that started the modern-day coaster wars. When it debuted in 1989, Magnum XL-200 broke the once-inconceivable 200-foot height barrier for roller coasters. In a class of its own at the time, Cedar Point coined the term, "hypercoaster," for its new ride. Today, hypercoasters refer generically to rides that, like Magnum, exceed 200 feet and are designed for height, speed, acceleration, and lots of airtime -- but not inversions. As I was assigning the "thrill scale" for Magnum, it occurred to me how odd it is that the legendary coaster "only" merits a 7 out of 10 possible points. When it first scaled its massive 205-foot lift hill, it was the epitome of a white-knuckle thrill ride and had adrenaline junkies salivating for a hypercoaster fix. 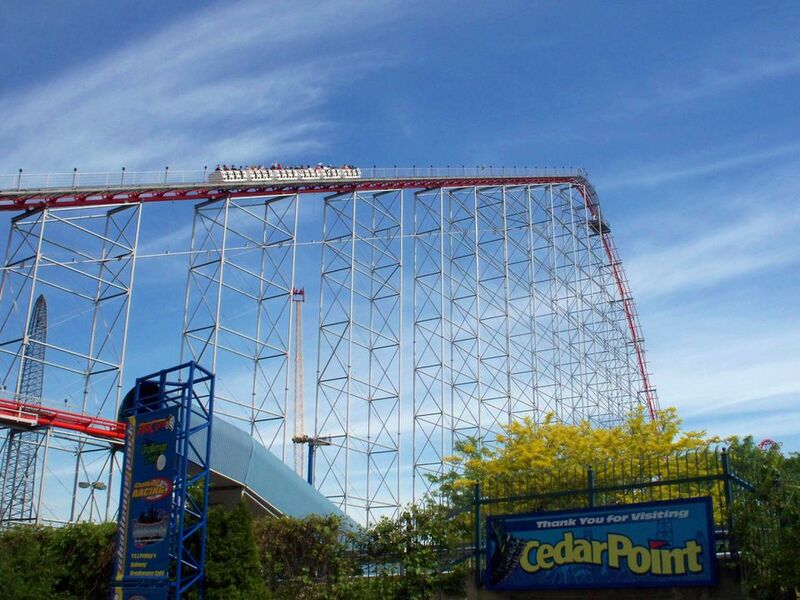 While it still delivers incredible thrills, it has been eclipsed many times over (including Cedar Point itself with the 310-foot Millennium Force and the 420-foot Top Thrill Dragster) and is no longer as audacious as it once was. As Magnum crashed the 200-foot threshold, it raised coaster fans' thrill threshold. By today's standards, it could almost be considered quaint. The ride is fairly simple. It climbs 205 feet, drops a hair-raising 195 feet, and delivers a wallop of airtime as it climbs and then drops into a second huge hill. At the bottom of the second hill, it soars into a covered tunnel, makes a sweeping turnaround, and navigates a series of bunny hills that deliver constant bursts of airtime all the way back to the station. Its location along the banks of Lake Erie adds to the drama. With the lake's blue water sparkling, the view as Magnum climbs its lift hill, drops, and careens into its turnaround is breathtaking. And a couple of other covered sections of track, including one near the end of the ride, keep the suspense going. But Magnum has lost more than its thrill cachet. It hasn't aged gracefully and can be rough in spots -- especially compared to some of the newer super-smooth coasters like Cedar Point's own Maverick. Depending on the time of day and other conditions, a ride on the steel Magnum can almost feel like a more rickety wooden coaster. Its train roars over a hill knocking its passengers side-to-side, goes airborne, and thuds as the upstop wheels engage, and then -- kerplunk! -- slams down as the positive G-forces kick in. Because of its comparative roughness, Magnum can't really compare to some of the more refined hypercoasters that followed it such as Apollo's Chariot at Busch Gardens Williamsburg and Mako at SeaWorld Orlando. But there is no denying that it occupies an important place in coaster history. There would be no silky smooth hypercoasters were it not for the pioneering Magnum.